Experience Oahu’sbrand new luau located at Sea Life Park, and featuring the always entertaining Chief Sielu. Famous for his appearances on The Oprah Winfrey Show and the Late Show with David Letterman, Chief Sielu has brought his luau to Oahu’s South Shore. Enjoy a scenic ridefrom the hustle and bustle of Waikiki and Honolulu, around the rocky cliffs that create the shoreline that stretches from Hanauma Bay to Makapu’u Lookout. A delicious island feast awaits, and you will surely love the selection. Everything from Poi, a local favorite dating back to Ancient Hawaii, Kalua Pork fresh from the underground Imu, and Pineapple Cake are available during your buffet, and a cash bar is set up for your must-have Mai-Tai. We hope you’re ready for a laugh and one of the best shows on the island! 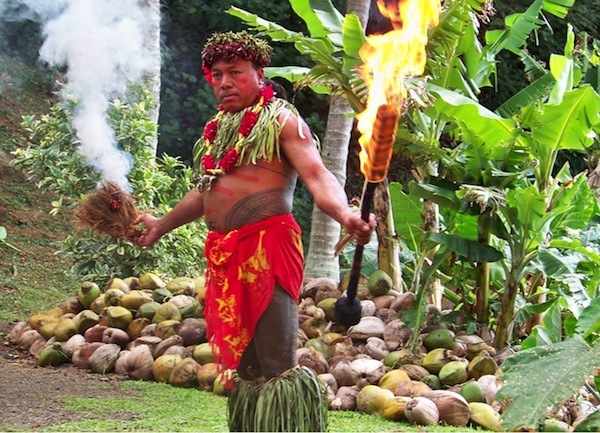 Chief Sielu is not only a world-renowned fire-knife dancer and performer; he puts on one of Oahu’s most popular shows. Throughout the night, become captivated by the exotic Hula Dancers, fire making, and spear throwing that the Chief and his crew demonstrate with expert precision. Get ready to laugh and take tons of pictures! The Chief’s performances are limited, and seats at the luau and show are highly requested. You certainly can’t miss out on this fun-filled party. Be sure to book your luau today, and prepare for a night you will not forget during your Hawaiian vacation! Cash bar for drinks to purchase for those 21 years of age and over.